Since I have Chronic Fatigue Syndrome and Fibromyalgia I am always looking for easy gardening tips. One of the best easy gardening tips I’ve ever heard is so simple yet so brilliant! What is it? Take a large tarp and lay it out flat. 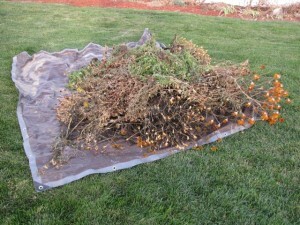 Then when you are cleaning up your garden beds then you can throw all your dead plants on the tarp and drag them to the compost pile. It takes me one or two trips instead of 8 or 10 using the wheelbarrow! I used to hate cleaning up my yard because I would be dead tired walking back and forth and back and forth with wheelbarrow loads of dead plants for the compost. Now since I can get it all thrown on the tarp it can take a lot less time to get it done. This works really great with old tarps that have a few holes. Just keep one always in your shed ready to go and you can have easy dead plant hauling! This is a great idea that I have used when it is time to rake leaves in the fall. I use a king size fitted sheet from the thrift shop. The elastic at the corners seems to make it easier to close up and carry, plus it is a lot lighter weight, though sturdy. And, it’s washable. I”m on my second season with it. Oh, this is brilliant! I love cleaning out my beds–weeding, edging, mulching, etc, but I always leave piles because I have a hard time with the wheel barrow, too. My husband often uses the tarp for dragging leaf piles to the curb, but I had never thought of using it to transport my piles to the compost mound.